I just wanted to let everyone know (well, the few people who read this) that I’ll be vending plants and knitwear at the Tower Hill Fall Sale this coming saturday. 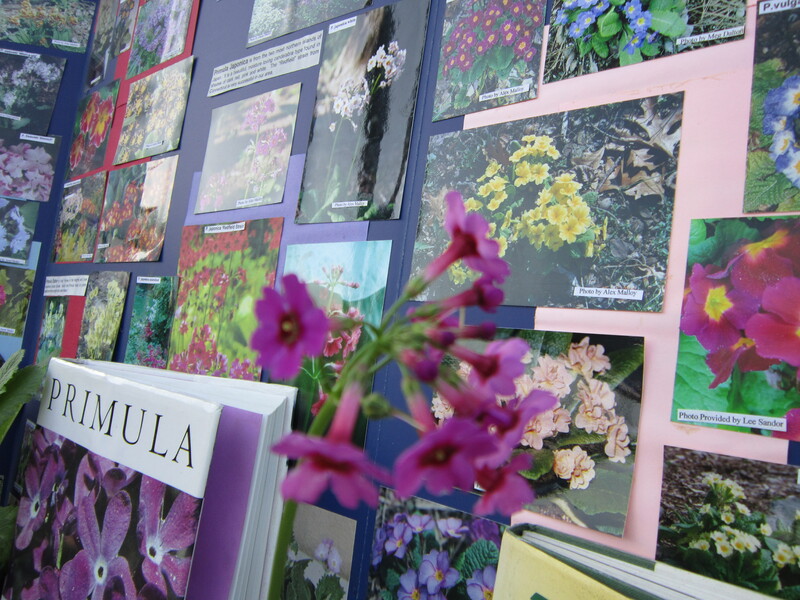 It will be a great opportunity to pick up some rare and unusual treasures for your gardens from specialty growers like Garden Vision Epimediums, horticultural societies such as the New England Primula Society, a chapter of the American Primrose Society, that I will be representing with a selection of Primula plants, seed and a poster board that shows just how many different primroses can be grown in the gardens of New England. 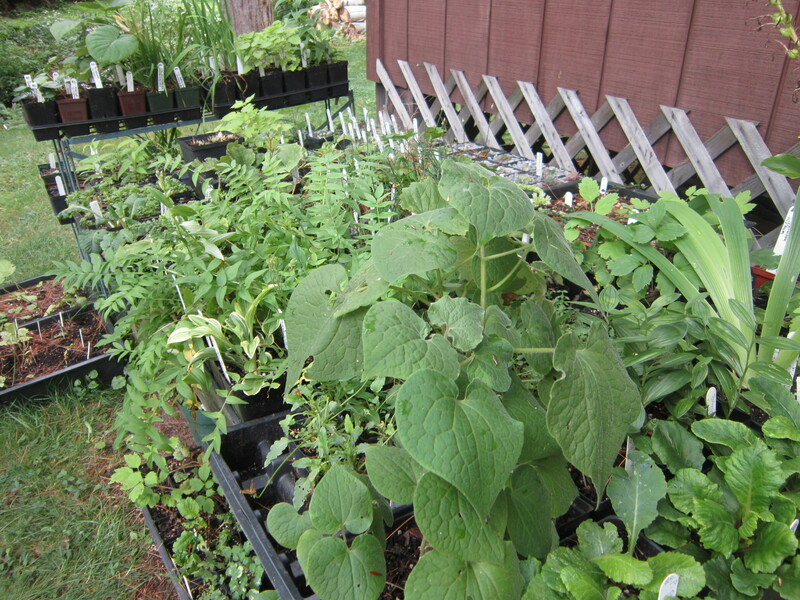 There will be a few area nurseries offering their plants as well. 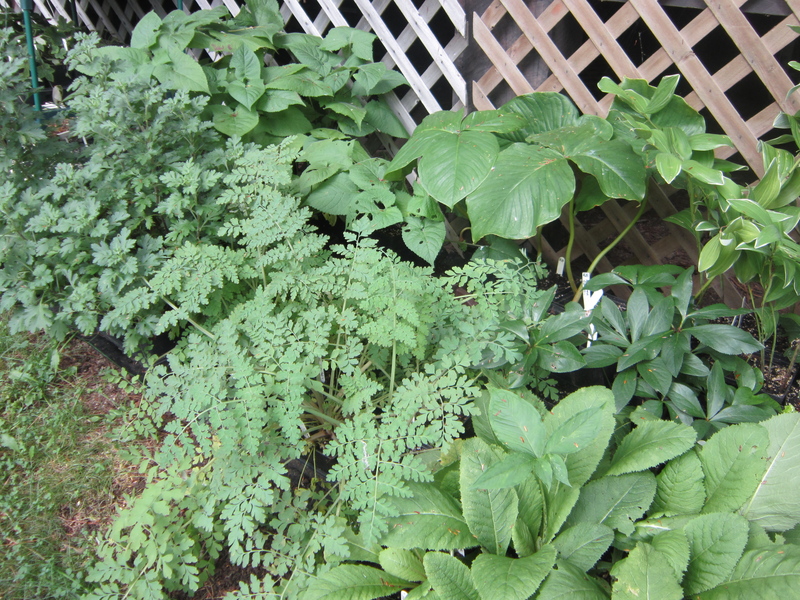 Here are a few photos of my plant tables from the spring plant sale in June this year…. I had the only red canopy….so it was easy to find me! 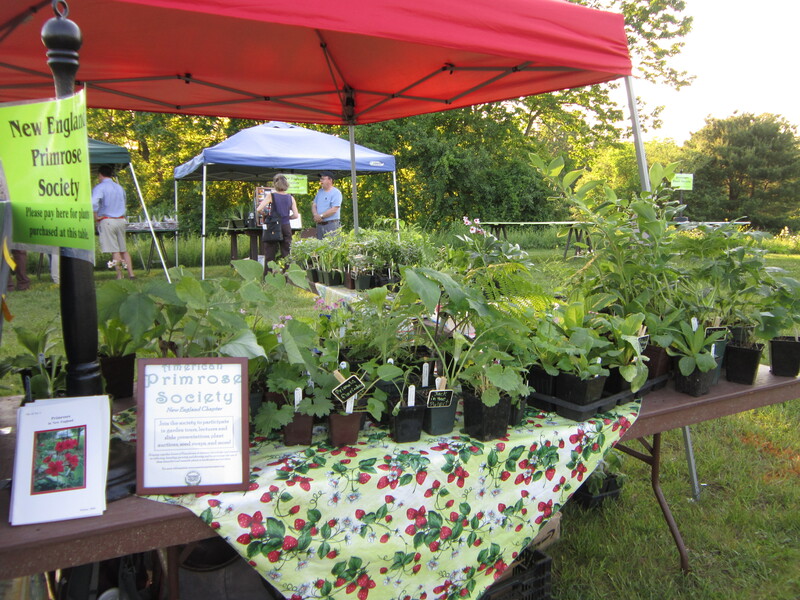 The chapter has a few educational photo boards that show many plants from member gardens all over New England. It’s very impressive when you see how many species are perfectly hardy here. I also bring lots of of my books on Primula for reference. 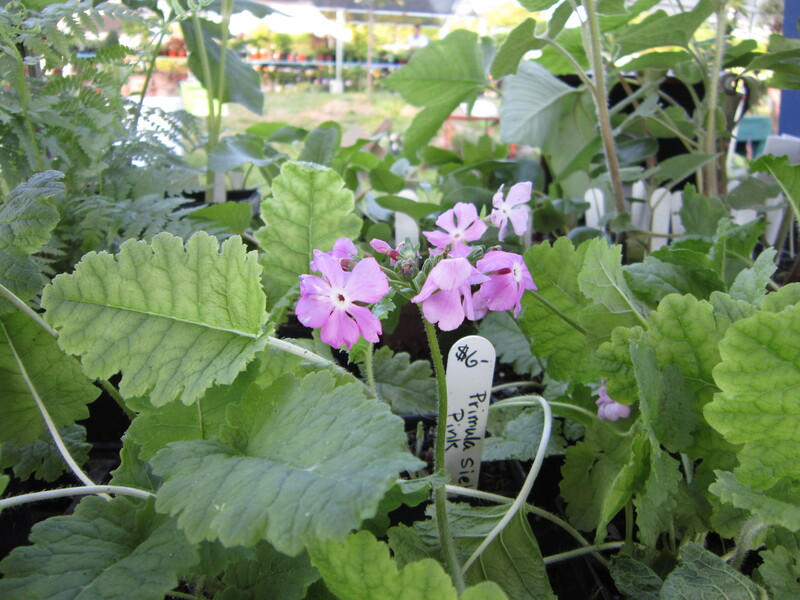 One of the Primulas sieboldii plants I brought that was still in bloom and not wilting from the 90*+ heat. 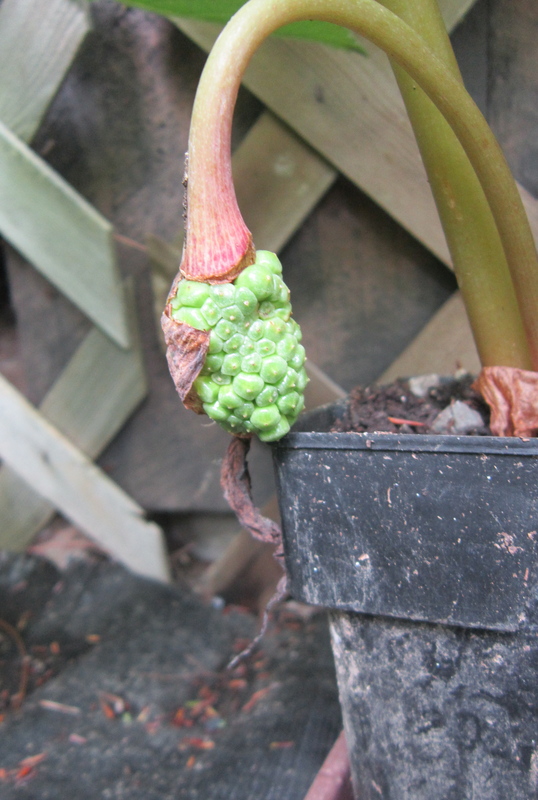 So many of my plants were wilting from the heat, made worse because all spring we had so many cloudy and rainy days they were not accustomed to the sudden heat. From front to back….Primula japonica, Helleborus x hybridus, Corydalis cheilanthifolia, Huge Arisaema fargesii, Salvia koyamae and Dendranthema ‘Sheffield Pink’ all budded up. Again, front to back…. Saruma henryi, Primula polyanthus, Polygonatum humile, Iris tectorum, Polemonium caeruleum, Adiantum venustum. Pretty sweet assortment eh? Hopefully one lucky shopper will buy this lovely Arisaema fargesii with the ripening cluster of seeds! If not I will let them fully ripen, harvest them, clean them and sow them! For more on collecting, cleaning, sowing and growing your own seeds stay tuned as that will be my next post. Thanks for visiting and perhaps I will see you on saturday at Tower Hill!